Direct-to-customer DNA testing has become so widespread that anyone can explore their genetic health and prerequisites for a wide spectrum of potential diseases and conditions. Hazardous genetic mutations can be veritable time bombs that can be activated at any given point within the affected genetic line. Carriers of mutated genes can be asymptomatic but still transfer the condition to their offspring. Therefore, it is very important to explore your genetic makeup in advance and take the necessary actions to protect your future children. Alternatively, you can take the test to improve the overall quality of your health, discover potential risks, and tailor your lifestyle in accordance with your genetic signature. Our ultimate guide to the best health DNA tests on the market can help you learn more about the top companies in the field and give you enough info to make a fully informed decision. The DNA testing companies featured on this list do not provide clinical tests intended for diagnostic or preventive use. While holding significant informative value, the health DNA tests offered by these companies should not be considered as an alternative to clinical health DNA testing. 23andMe is a renowned ancestry and health DNA testing provider launched back in 2006 in Mountain View, California. It is one of the founders of the direct-to-customer business model. New Life Genetics is one of the most interdisciplinary providers of health DNA tests on the market. It focuses on providing its users with an opportunity to lead healthier and longer lives. 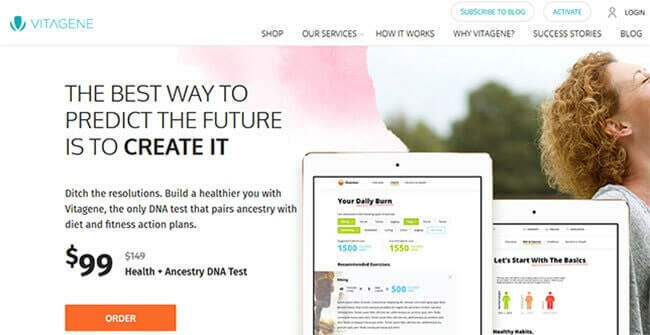 Vitagene is dedicated to providing its users with the most convenient and budget-friendly DNA testing solutions designed to explore not just their ancestry but also health predispositions as dictated by their genetics. Pathway Genomics was founded in 2008 in San Diego by Jim Plante as a private medical diagnostics company dedicated to giving you and your physician full control of your health and wellness. Orig3n is a startup dedicated to Health & Fitness DNA testing but also to creating an induced pluripotent stem cell technology, which should change regenerative medicine as we know it. TeloYears is a health-related DNA test developed by Telomere Diagnostics Inc. The purpose of the test is to determine the cellular age encoded in your DNA and tell you how well you are aging. Futura Genetics is a health DNA testing company founded in 2014, with corporate headquarters located in Vancouver, Canada. It focuses on providing affordable and accurate information on the human genome. The most important criterion in ranking health DNA tests is the number of genetic diseases and conditions covered. The more illnesses the test checks for, the more accurate the results. In order to verify the accuracy and quality of the tests, we use additional criteria such as the likelihood of test errors and failures, the quality of the processing facilities, and the competency of the staff. Other factors we focus on during our ranking process include overall service quality, average turnaround times, membership benefits, and overall expenses, which are all reliable indicators of potential customer satisfaction. These are our most important ranking factors, but there’s a number of internal low-impact criteria that help us differentiate between services of a similar quality. Taking into account these factors, we developed our list of the best health DNA tests on the market. You can read their mini-reviews below and prepare to unlock all the health-related secrets hidden in your DNA code. 23andMe is probably the most famous DNA testing provider on the market. It focuses on ancestry genetic exploration but also offers a health-related portion of the results for an extra fee. 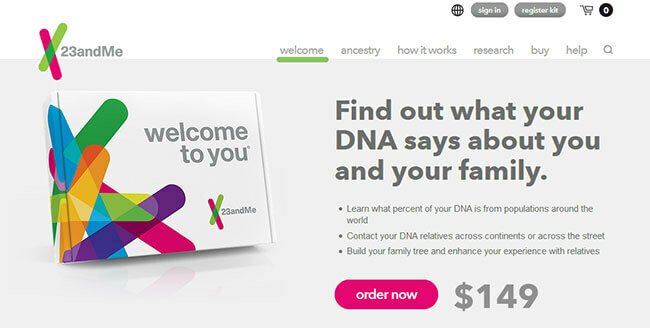 This makes it the only ancestry service to pay attention to your genetic health. Launched in 2006, 23andMe is a privately held biotechnology and personal genomics company, with corporate headquarters in Mountain View, California. Its direct-to-customer business model was declared Invention of 2014 by The Times Magazine. The company’s basic ancestry DNA test, which costs 99$, is a prerequisite for ordering its health test. This, however, might pose a problem to individuals interested only in their genetic health and not ancestral lines. The health test costs an additional 100$. Your 23andMe health report will check for 8+ genetic health risks (including Late-Onset Alzheimer’s Disease, Hereditary Thrombophilia, Parkinson’s Disease…), 40+ carrier status reports (including Sickle Cell Anemia, Cystic Fibrosis, Hereditary Hearing Loss…), 7+ wellness reports (including Deep Sleep, Genetic Weight, Lactose Intolerance…), and 19+ traits reports (including Sweet vs. Salty, Male Bald Spot, Unibrow…). The company guarantees anonymous genotyping, allowing customers to use a pseudonym up until they register their personal account. However, your genetic material will be stored separately from your personal data, so no one will be able to connect the two. In other words, the staff connects your DNA sample and results with your unique registration code rather than your name and other personal info. New Life Genetics is a DNA testing provider dedicated to uncovering the potential locked in our genetic code and solving major medical mysteries. In order to achieve this, it has gathered an interdisciplinary team of scientists, with staff members specializing in genetics, nutrigenetics, nutrigenomics, fitness, health, nutrition, dietetics, and human nutrition. This cooperation between biotechnology, genetics, and dietetics is everything New Life Genetics stands for. New Life Genetics features 8 different health DNA tests, all designed to answer some of the most important questions regarding your overall health and wellness. Its testing solutions incorporate everything from weight loss and fitness tests to those designed to combat your stress or problems with skin and acne. The prices range from 113EUR up to 284EUR, which might seem a bit steep but is definitely justified by the value provided. New Life Genetics also pays great attention to the safety of user information. It incorporates numerous physical and technical measures in order to ensure the complete security of your sensitive data. All connections to its website are encrypted with SSL technology, so you don’t have to fear your personal or payment details will ever leak to any third party. Your DNA samples are destroyed the moment your final report is generated, but you can also request for them to be permanently stored in the company’s database in case you plan on performing more tests in the future. Since 2014, Vitagene has helped thousands of users make fully informed life choices by unlocking the secrets hidden in their DNA. The company can tell you everything about your past through its ancestry DNA testing but also help you create a healthier future for yourself and your loved ones. Vitagene combines cutting-edge technology and scientific breakthroughs with convenient and budget-friendly testing options. Its service is equally dedicated to helping people on an individual level and reshaping the healthcare industry as we know it. Vitagene offers direct-to-customer testing solutions, which means you’ll be able to collect the relevant DNA samples (buccal cells) in the privacy of your own home. You can then simply mail them back to the company’s CLIA and CAP-accredited lab for further processing. Your results will be available 4-6 weeks after the lab receives your samples. You’ll receive an email notification when your report is generated and you’ll be able to inspect it on your personal Vitagene dashboard. Vitagene currently offers 5 different products: Health Report + Ancestry (79.00$), Health Report (49.00$), Smart Supplements (Essential – 49.00$ per month; Premium – 79.00$ per month), Wellness Bundle (Health Report + Ancestry + 1 month of Essential Supplements – 149.00$), and Vitality Bundle (Wellness Bundle with a 4-month subscription to 4 personalized supplements – 245.00$). The company only accepts orders made in the US at the moment and sends its DNA testing kit with a prepaid mailer. In other words, you won’t have to worry about the return shipping costs. If you have any doubts or questions, you can contact its user support via email, phone or live chat Mon-Fri 9:00 AM – 6:00 PM PT. Pathway Genomics is a privately held medical diagnostics company dedicated to providing physicians and their patients with full control of their health and wellness. The company was founded in 2008, with corporate headquarters in San Diego, California. Jim Plante, the founder of Pathway Genomics, launched the company after his father passed away from an inherited polycystic kidney disease. He was guided by the vision of making budget-friendly personalized medicine and genetic testing accessible to everyone. In 2014, the company partnered with IBM Watson Group OME, resulting in a mobile app based on deep learning and AI. Pathway Genomics currently offers 13 different DNA tests, 4 designed for home use and 9 that can be ordered by your physician. The at-home tests focus on your physical traits and needs, dietary recommendations, metabolic health factors, and skin care. The prices range from 99$ to 399$. The tests use buccal swabs for DNA sample collection. The average turnaround time is between 2 and 3 weeks. Physician-only tests also begin with at-home sample collection, but they use saliva or blood. They are divided into 3 categories: Health & Wellness, Carrier Screening (checking for more than 120 recessive genetic disease and conditions), and Hereditary Cancer. Pathway Genomics takes good care of your personal information. Note that there are some cases when the company can disclose your info without your consent (payment, treatment purposes, business associates, health care operations, research, family, friends, and caregivers…). Orig3n began as a successful startup launched in 2014 in Boston, Massachusetts. The company excels in the field of biotechnology, developing state-of-the-art treatments for genetic conditions affecting heart, liver, and neurodegenerative indications. The basic skeleton of the company’s business model is based on Nobel Prize-winning technology. It is intended to remove trial & error from the disease treatment process. This will, ideally, bring us a much longer and healthier life. The company’s ultimate effort is focused on creating an induced pluripotent stem cell technology able to create cells that can turn into any type of cell in the human body. This would revolutionize regenerative medicine as we know it. Orig3n currently offers 6 DNA tests designed to give you an essential insight into your overall wellness, fitness potential, and genetic predispositions. The tests use buccal swabs for DNA sample collection, so the procedure takes only a couple of minutes. Note that individuals under 18 must provide consent form a parent or guardian in order to take any of the tests. There’s no upper age limit as long as you can provide a viable sample. The average turnaround time is around 4 weeks. Orig3n encourages users to include their families in DNA testing in order to provide the most accurate genetic picture possible. The price tags range from 29$ to 149$. Orig3n also runs the biggest crowdsourced biorepository of induced pluripotent stem cells in the world. The project is called “LifeCapsule” and it allows scientists to experiment and create iPS cells. The annual membership for the LifeCapsule Program is 99$. TeloYears is a very simple health DNA test developed by Telomere Diagnostics Inc. The company itself was launched back in 2010, with one of the founding members being Dr. Elizabeth Blackburn, the winner of the 2009 Nobel Prize in Medicine for her pioneering work in the field of telomere biology. The price of TeloYears DNA test is 99$ and the company also offers the possibility of purchasing its “Now and Later” pack, allowing you to save 20$. The pack contains two tests that are used to establish the cellular age encoded in your DNA and monitor its progress over the period of 6 or 12 months. For optimal results, you should repeat the test every year in order to monitor the shortening of your telomeres and the progress of your genetic age. Note that TeloYears test doesn’t use saliva or buccal swabs but blood as your DNA sample. It analyses the DNA found in your leukocytes by using the company’s proprietary “Cawthon qPCR assay” method. The end result is a very accurate representation of your genetic age with a variability coefficient between 2-3 percent. The results are usually generated in 3-4 weeks. The final report also includes its free “Blueprint for Aging Well,” which provides a tool for self-assessment, a detailed overview of how certain factors like stress or inflammation affect your health and genetic age, a suggested action plan, and a comprehensive view of the science applied to your case. 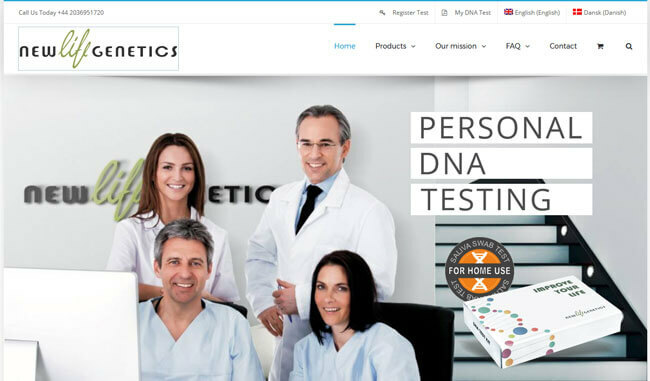 Futura Genetics is a company dedicated to healthcare and lifestyle DNA testing. Its goal is to provide the general public with knowledge of the human genome at budget-friendly prices. The company was launched in 2014, with headquarters in Vancouver. Futura Genetics capitalizes on the fact that recent scientific breakthroughs in DNA sequencing greatly reduced the overall price of genetic extraction, making it available to ordinary users and not just to big corporations or wealthy individuals. The company has thus developed a very accurate health DNA test that screens for a wide spectrum of genetic diseases and conditions. Futura Genetics currently offers only one all-encompassing health DNA test. The price is 339EUR for European customers and 413EUR for users from the US and Canada. The test checks your genetic predisposition for 28 different genetic maladies. Some of the screened diseases include lung cancer, Alzheimer’s, migraine, melanoma, lupus, obesity, multiple sclerosis, alopecia, prostate and breast cancer, type 1 and 2 diabetes, and others. The test uses saliva to extract your DNA sample, so the entire sample collection procedure should take between 2 and 5 minutes. The company also takes the privacy of its users very seriously. Your personal information will be stored within the EEA and processed by the company staff. SSL technology is also incorporated in order to protect user data from potential hacking attacks. The Futura Genetics testing kit is completely anonymous; it’s identified via the unique barcode rather than your personal information. Finally, the company will never share your data with anyone or provide results over the phone or email. Health-related genetic testing has advanced to the point of being able to offer testing solutions that used to look like futuristic fantasies just a couple of years ago. Today, you can measure the length of your telomeres to determine your genetic age, check your potential for certain sports and physical activities, adjust your nutrition plan according to your genetic dietary needs, take care of your skin by “listening” to your DNA, discover your genetic talents, and receive many more life-altering reports designed to unlock the secrets hidden within your DNA. The most important aspect of health DNA testing, however, is the fact that you can discover genetic mutations responsible for some of the deadliest genetic diseases known to man. This is especially important if you’re thinking of starting a family since you and your partner will be passing your genetic signatures down to your offspring. Knowing the potential dangers can help you and your children lead better lives by adjusting your day-to-day routines appropriately. Our ultimate list of the best health DNA tests included the best providers on the market, covering a wide variety of testing solutions that utilize revolutionary ideas and futuristic technologies. We hope that our guide has helped you narrow down your search for the right testing solution and allowed you to reach the best possible decision to suit your personal needs and those of your entire family.